Krystal is also looking for this same giraffe. I have been spending so much time looking for a pastel giraffe that plays music when you wind it up. It also turns its head around and around when wound up. 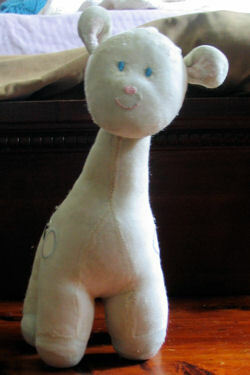 It’s a Carter giraffe that was sold in stores like Target, Walmart, Marshall, and TJ Max right before the end of 2002. I bought one for my 6 month old baby for about $6 then. Prestige Toy company made it. I believe the body’s color was light yellow, the mane was green, the hooves and horns were light blue, all four dots (2 on each side) were pink with blue contour, and at the end of the tail were 5 or 6 strands of blue yarn. I did not realize that my daughter loved this toy so much that she could not sleep without it For the past 6 years, I relentlessly searched high and low for a replacement. I started going to garage sales and looking on the internet for this baby. My daughter’s giraffe is falling apart, color is faded and stained, skin rubbed off, stuffing is oozing out to the point that my daughter was afraid of holding her at night. She just gently lays it down in her bed, but not too close so she wouldn’t damage it any further. This giraffe, named Raffi, is definitely well loved. what color pastel was it originally? what color were the dots, the mane? 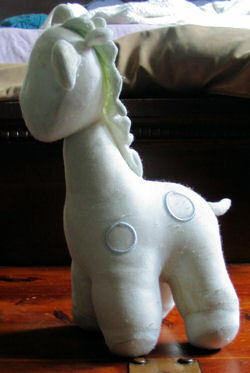 did it have dots like this rattle plush? I believe the body’s color was light yellow like the one you refer to, the mane was green, the hooves and horns were light blue, all four dots (2 on each side) were pink with blue contour, and at the end of the tail were 5 or 6 strands of blue yarn. Hope this help. And THANK YOU!!! I have found my daughter one (but music doesn’t work) at a church sale and she loves her new Raffi. A few days ago, I found another on eBay but it was an auction with 9 other vintage toys and the seller refused to sell me Raffi so I had to bid against 3 other buyers. I won but with a high price, $127 + $18 for shipping. My daughter, now 8.5 years old, agreed to let this Raffi go in order to recouperate some of the cost. If you’re interested to make her an offer, please reply. Thanks! Kim.